The final RTM build of Windows 10 Creators Update version 1703, codenamed Redstone 2 (RS2), has been released to Windows Insiders on both Fast (on March 20th) and Slow ring (on March 24th). The build number is 15063 with full build string of 15063.0.170317-1834.rs2_release. Officially, Microsoft no longer uses the term RTM as Windows is now subjected to continue updating with Windows as a Service. However, the Windows 10 Build 15063 is the “release to manufacturing” build that will make its way to OEMs to load onto the new PCs. In addition, Microsoft would not confirm or announce early that Windows 10 Build 15063 is indeed the RTM build. The confirmation comes with leaked Windows 10 Update Assistant that stated that the latest version is 15063. All Windows Insiders can now download and install Windows 10 Creators Update v.1703 Build 15063 via Windows Update. Microsoft is expected to make Windows 10 Creators Update generally available to end users in April 20017. As with last few preview builds of Windows 10 Creators Update released, Microsoft has focused on bug fixes ahead of general availability and no new features are added, which would be insane to do anyway when it’s such close to release date. Users on Windows 10 Anniversary Update v.1607 (Build 14393) who can’t wait to use the next iteration of Windows can join as Windows Insider and enjoy Windows 10 Creators Update v.1703 few days or weeks ahead of the pack. The upgrade path from Windows 10 Build 14393 directly to Windows 10 Build 15063 is now officially supported and all language packs are available. 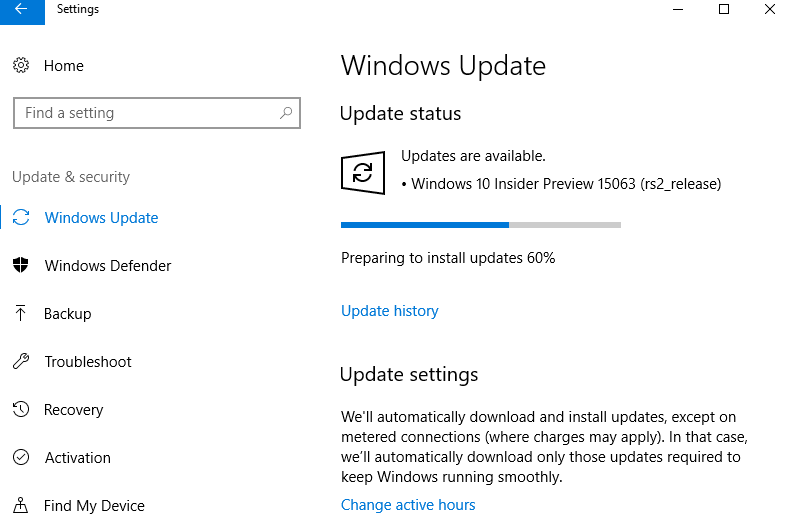 The downloaded update’s name is Windows 10 Insider Preview 15063 (rs2_release) but it just reflect the channel and doesn’t affect the functionality. If you don’t have to join Windows Insider program, the Windows 10 Build 15063 ISO images for various editions of Windows 10 have been made by Windows enthusiasts from ESD and UUP files downloaded from Microsoft’s servers (ESD and UUP are used by Windows Update). You can search and download the Windows 10 Build 15063 ISO that corresponds to your edition of Windows 10. Don’t trust anybody else? Download the official ESD file via download link provided by XML of Windows 10 Update Assistant, then convert the ESD to ISO yourself. With Windows 10 Creators Update ISO image, perform the in-place upgrade. Windows 10 Build 15063 is released for both PC and Mobile and does have some known issues which are listed here.